About this Peeky Web Cam Cover:The Peeky web camera cover is perfect in today's age of internet security and privacy. Made of ABS plastic with an adhesive that will not leave residue on monitors nor laptops, this web camera cover is thin enough to still allow most laptops to close properly. It includes a simple, sliding shutter that easily moves to the side and allows a web camera to be visible when needed. An area for printing your logo will keep your brand front and center every time your clientele uses a computer.This product is not recommended for glass or very glossy screens. Protects Privacy Adhesive on Back Prevents Scratches 6 Available Colors Protects Privacy If you're worried about cyber security, a webcam cover can provide peace of mind from hackers invading your privacy. Adhesive Strips This promotional web cam cover features ashesive strips on the back that easily stick to your computer monitor. Lens Shiels Webcam covers not only protect your privacy but your webcam lens, preventing it from getting scratches. Price Match Guarantee If you find these Gold Bar Paperweights customized cheaper elsewhere, AnyPromo won't just match the price, we'll beat it. Special Instructions:Rush Service:1. Purchase Order must clearly state artwork instructions and logo to be used.2. One Color/One Location Imprint Only.Other imprint methods may be available; please call for details. Please note that product images may not depict the standard imprint method included in pricing. About this Vector Wireless Optical Mouse:Sleek ergonomic design perfect for either travel or at a desk. Small built-in Nano receiver which receives signal up to 10 meters away. Also, has power off capability to preserve battery life and a 2,000 CPI with three speeds for conversion. Item is Plug & Play. Manufactured By Leeds. Note: Instructions Included: No Materials: ABS PlasticSpecial Instructions:Other imprint methods/areas may be available; please call for details. Please note that product images may not depict the standard imprint method included in pricing. About this Freedom Wireless Optical Mouse:Uses radio frequency wireless technology.Automatic power-saving sleep function prolongs battery life.Hidden compartment for storing USB connector.Plug and play technology.Material: Plastic.Special Instructions:1 Day Rush, available upon request for 1 color, 1 imprint location orders. About this Foldable Virtual Reality Headset:This foldable silicone VR headset allows you to discover virtually reality. Clip to your smartphone and launch a VR app to dive into a virtual world in just a few seconds. You can enjoy 3D videos, VR games, 3D movies and much more! It is compatible with most smartphones with a 4-5 inch screen. Material: ABS Plastic and Silicone.Special Instructions:1 Day Rush, available upon request for 1 color, 1 imprint location orders. About this Tastic USB Fan:Power button free, USB fan to use on laptop, powerbank or in combination with a car adapter inside your vehicle. Removable, silicone propeller for safe use and easy storage. Material: TPR.Special Instructions:1 Day Rush, available upon request for 1 color, 1 imprint location orders. About this Prisca Wireless Mouse:2.4Ghz wireless mouse with 3 button function, scroll wheel, USB receiver stores in mouse body and includes 1 AAA battery. Finish / Material: Plastic. 800 dpi Resolution.Special Instructions:Rush Service:1. Purchase Order must clearly state artwork instructions and logo to be used.2. One Color/One Location Imprint Only. About this Zoom(R) Gridlock Bluetooth Keyboard:Are you looking for the perfect giveaway? Something a little extra special to show your appreciation? Well look no further! The Zoom Gridlock Bluetooth Keyboard is one of the top selling tech items on the market today! With over 33 feet of effective working range, this foldable Bluetooth keyboard is not only convenient for the home or office, but it's convenient on the go! Most commonly used for Corporate Gifts, Teacher Appreciation, Conferences & Tradeshows, Healthcare Campaigns, and Job Fairs! • Ideal for the business traveler or student who uses their iPad, Galaxy Tablet, or any other Bluetooth enabled tablet or smartphone. • Compatible with all Bluetooth enabled devices. • Aluminum protective keyboard cover easily converts into a stand for tablets and smartphones. • Effective working range is 10 meters (33 feet) from the Bluetooth device and includes Micro USB to USB charging Cable.Special Instructions:Other imprint methods/areas may be available; please call for details. Please note that product images may not depict the standard imprint method included in pricing. About this Versa 3- in -1 Charging Cable in Case:The Versa 3-in-1 Charging Cable comes in a round case with a multi USB cable that includes a USB Type C tip and a 2-in-1 dual compatible tip for both Apple® iOS and Android devices. Material: Plastic case.Special Instructions:1 Day Rush, available upon request for 1 color, 1 imprint location orders. About this Glendale Desktop Cable Organizer:Organize and neaten your work space by keeping up to five of your accessory cables in one place using this desktop cable organizer. Weighted bottom keeps it where you want it. Finish / Material: ABS Plastic.Special Instructions:Rush Service:1. Purchase Order must clearly state artwork instructions and logo to be used.2. One Color/One Location Imprint Only. About this Terzo Neoprene Travel Case:Neoprene Travel Case. Neoprene computer accessory travel case has white contrast stitching, hook & loop flap closure, dual zippers and carry strap. Finish / Material: Neoprene. Hook & Loop Closure. White Contrast Stitching.Special Instructions:Rush Service:1. Purchase Order must clearly state artwork instructions and logo to be used.2. One Color/One Location Imprint Only. About this 4- Port USB Hub:Accent 4 Port USB Hub. Connect To Multiple Devices At Once!4 High Speed USB Ports.2.0 Interface.Special Instructions:Rush Service:Catalog Quantities Only.One Color And One Location. About this Super Mini Optical Mouse:The Super Mini Optical Mouse is compatible with Windows and Mac operating systems and comes with a retractable USB cord that extends 27 inches.Material: Plastic.Special Instructions:1 Day Rush, available upon request for 1 color, 1 imprint location orders. About this The Rotas USB Hub:4-port rectangular USB 2.0 hub with foldable input port.Media devices and cables not included.Material: Plastic. About this Two Blade Mini Flexible Fan:Great For Work Or Home.Connect To Any USB Device.Made Of Flexible Material.Small Plastic Safety Blades.Perfect Size For Purse Or Pocket.Special Instructions:Rush Service:Catalog Quantities Only.One Color And One Location. About this Galactic Wireless Mouse:The Galactic Wireless Mouse is perfect for either travel or at a desk. Small built-in Nano receiver which receives signal up to 10 meters away. Also, has power off capability to preserve battery life and three different DPI (800, 1200, 1600) for speed adjustment.Material: ABS Plastic.Special Instructions:Other imprint methods/areas may be available; please call for details. Please note that product images may not depict the standard imprint method included in pricing. About this Flexible USB Hub:4-port 2.0 USB Hub with 30" USB cord.Foldable design.Plug and play technology.Material: Plastic. Related Search Terms: USB HubSpecial Instructions:1 Day Rush, available upon request for 1 color, 1 imprint location orders. About this Star USB Hub:4-port 2.0 USB hub. Compatible with any USB port. USB cord extends 7-1/4". Media device not included. Material: Plastic. Media device not included.Special Instructions:1 Day Rush, available upon request for 1 color, 1 imprint location orders. About this 4 Port Aluminum USB Hub:Expand Available USB Ports On Your Computer For Additional Peripherals (Mouse, Keyboard, Printer, Etc. )4 High Speed USB Ports.2.0 Interface.Special Instructions:Rush Service:Catalog Quantities Only.One Color And One Location. About this Portable Projector:The portable projector small enough to fit In your hand is packed with a 50-Lumen bulb. Go big with our pocket-sized HD projector. There portable projector connects to multiple devices for a "big screen" view of just about anything. Compatible with a USB flash drive, SD Card, or an HDMI connection. Its capable of projecting Photos, Videos, or work documents. Its a great addition to any office setting. Includes remote control for easy navigation. Power source is a rechargeable battery or an AC cord(both included).Material: ABS Plastic.Special Instructions:Other imprint methods/areas may be available; please call for details. Please note that product images may not depict the standard imprint method included in pricing. About this The Milo Wireless Mouse:Bright optical mouse uses radio frequency technology and DPI function.The DPI button makes it possible to quickly change the sensitivity of your mouse.Includes wireless USB receiver.Compatible with Windows and Mac operating systems. Media device not included. Material: ABS Plastic. About this Brick USB Hub:4-port USB 2.0 hub. Compatible with any USB port. USB cord extends 6.5". Material: Plastic.Special Instructions:1 Day Rush, available upon request for 1 color, 1 imprint location orders. About this Rustic Wireless Charging Pad:The Rustic Wireless Charging Pad features with bamboo finish surface that allows you to charge your smartphone without the cables. Supports wireless charging at up to 1A for devices including (but not limited to ): iPhone 8/8Plus/X *Samsung Galaxy Note5/S6/S6 Edge/S6 Edge+/S7/S7 Edge/S8/S8+ * Google Nexus 5/6/7 * HTC Droid DNA, 8X * LG G3/G4, Lucid 2/3 * Nokia Lumia 920/930 *. If want to charge an iPhone series before iPhone 8 with wireless technology, an external wireless charging receiver or receiver case is required.Material: Plastic. Compatible phones include some of the following: Apple iPhone: 8, 8 Plus, X, XR, XS, XS MAX Samsung Galaxy: Note 9, S9, S9+, Note 8, S8, S8+, S7, S7 Edge (Plus more devices) Sony: Xperia XZ3, Xperia XZ2 Premium, Xperia XZ2 (Plus more devices) *Please check your device specifications prior to purchase. Special Instructions:1 Day Rush, available upon request for 1 color, 1 imprint location orders. About this Elfin Mini Wireless Mouse:The Elfin Mini Wireless Mouse is a optical mouse that uses a radio frequency technology with a DPI function of 1000 level. It includes a wireless USB receiver and is compatible with Windows and Mac operating systems. Compact size for travel perfectly. Material: Plastic.Special Instructions:1 Day Rush, available upon request for 1 color, 1 imprint location orders. About this 4- Port Aluminum Wave USB Hub:Expand Available USB Ports On Your Computer For Additional Peripherals (Mouse, Keyboard, Printer, Etc. )4 High Speed USB Ports.2.0 Interface.Special Instructions:Rush Service:Catalog Quantities Only.One Color And One Location. About this USB Desk Caddy:Lights Up When In USB Ports Are In Use.Expand Available USB Ports On Your Computer For Additional Peripherals (Mouse, Keyboard, Printer, Etc. )3 High Speed USB Ports.Cable Included.Convenient Caddy Holds Pens, Notes And More!Special Instructions:Rush Service:Catalog Quantities Only.One Color And One Location. About this Traveler Bluetooth(R) Keyboard:The small, lightweight sturdy Bluetooth® keyboard is perfect to use with tablets, mobile phones, TVs, and other Bluetooth devices that compatible with iOS, Android, Mac system or Windows with Bluetooth® function. The operating distance is up to 10 meters. Material: Plastic.Special Instructions:1 Day Rush, available upon request for 1 color, 1 imprint location orders. Thank you Collin, Xavier and Isaac! This item is our highest performing product in this category! We’re constanly filling orders for our promotional Rotas USB Hub. Need more ports to connect your usb device? Well this is your answer! Get additional ports with this convenient promotional item. 4-port rectangular USB 2.0 hub with foldable input port. Media devices and cables not included. Thank you Melissa and Jasmin! We’re glad to read your positive reviews on our 4 Port USB Hub. Port USB Hubs are always convenient in office settings for employees and at school for students. You could never go wrong with giving them extra ports to plug many devices in. Order your 4 Port USB Hub here. Thank you Gage and Evan for your reviews! This promotional item is a fun marketing tool everyone will love to have! Virtual reality has become very popular recently. Move along with the trend with this Foldable Virtual Reality Headset. This foldable silicone VR headset allows you to discover virtually reality. Clip to your smartphone and launch a VR app to dive into a virtual world in just a few seconds. You can enjoy 3D videos, VR games, 3D movies and much more! It is compatible with most smartphones with a 4-5 inch screen. With over 150 promotional computer accessories, you have many options to choose from. We have cable organizers, mini usb ports, bluetooth keyboards, reality glasses, cord wraps, wireless laser pointer, and more! Computer accessories are great for all the tech savvy customers. With technology at a high rise, you can guarantee computer accessories to be a popular marketing tool for your next event! 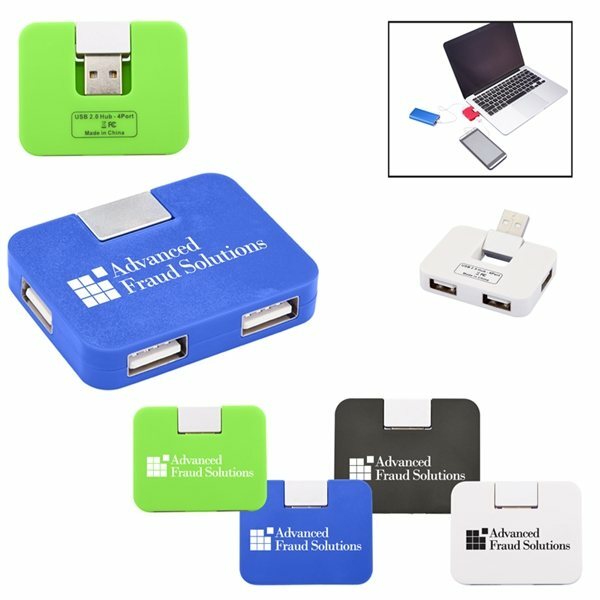 Promotional computer accessories are great for all events and for all customers. Imagine giving your customers a mini mouse, USB hub or optical mouse. They’ll be excited to use their computer accessory at home! Look through our selection of computer accessories. Shop here! Just like our customers, AnyPromo sets the bar high when it comes to making big brand impact, while getting the best bang for your buck! Click through our inventory of promotional computer accessories to find what best fits your goals. These event fan favs will be in high demand instead of winding up in the trash. Save money and make a BIG hit at events with our specially priced computer accessories. Great for biometrics, refrigeration, and refreshing the air, technology electronics do the trick! Check out our computer accessories on sale now. Below you’ll find a most wanted list of some of our trending computer accessories. Every item is available and ready for ordering through our helpful staff. Log on! Grab your promo tech today! Promotional computer accessories are fun items to give away. Customers get excited for technology items, so make your booth popular with computer accessories. Deciding whether to get computer accessories? You should! Promotional tech items are always a successful give away at any event. You could also give these items to your employees so you can see the items being used around the office! Our featured list of computer accessories are currently trending in this category. Don’t miss out on these promotional items!